Anesthesiology was the first medical specialty to champion patient safety as a specific focus. The coincidence of multiple factors beginning in the late 1970’s led to significant changes in practice that have decreased mortality and catastrophic morbidity caused by anesthesia administration. The Anesthesia Patient Safety Foundation (APSF) was the first independent multi-disciplinary organization (practitioners, equipment and drug manufacturers, and many related professionals) created expressly to help avoid preventable adverse clinical outcomes, especially those related to human error. Anesthesiology is widely recognized as the pioneering leader in patient safety efforts. Although reports were anecdotal and imperfect, from the 1950’s through the 70’s, there was a widespread impression that anesthesia care itself caused a mortality of 1-2/10,000 anesthetics, which was perceived to be unacceptably high. Anesthesiologists constituted 3% of physicians and generated 3% of the malpractice claims, but those claims accounted for a disproportionately high 12% of medical liability insurance payout. A seminal publication from Harvard in 1978 described the use of the aviation-inspired critical incident analysis technique to understand the causes of anesthesia-related mishaps and injuries. In the early 1980’s, national media publicity turned a harsh spotlight on anesthesia accidents that injured patients. 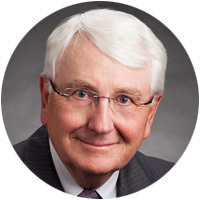 Thus stimulated, and avoiding the urge to fixate on tort reform, E. C. Pierce, Jr., MD, the 1984 President of the American Society of Anesthesiologists (ASA) constituted a new ASA standing committee on Safety and Risk Management, emphasizing the need to address the causes of patient injury. That same year, Pierce and Harvard colleagues convened the International Symposium on the Prevention of Anesthesia Mortality and Morbidity, which constituted the first organized examination of what was soon to be known as “anesthesia patient safety.” There the idea for the APSF was born. The APSF was launched in late 1985 as an independent (allowing organizational agility and the freedom to tackle openly the sensitive issue of anesthesia accidents), nonprofit corporation with the vision that “that no patient shall be harmed by anesthesia.” Financial support came from the ASA and several corporate sponsors. Members of the APSF Board of Directors represent a broad spectrum of stakeholders, including anesthesiologists, nurse anesthetists, nurses, manufacturers of equipment and drugs, regulators, risk managers, attorneys, insurers, and engineers. The APSF grew rapidly in impact. Its highly respected quarterly Newsletter became and remains the largest circulation anesthesia publication in the world and serves to communicate safety-related news, ideas, and opinions. The research grant program has funded many projects that provided insight into and suggested solutions for safety problems. Prior to APSF there was no centralized effort to fund research directed specifically to patient safety. Over the years a cadre of patient safety investigators have evolved as a result of the APSF research awards program. The extensive educational efforts included publication of books, co-sponsorship of a large video tape series, organization of the heavily-trafficked “patient safety booth” among the exhibits at the ASA annual meeting, and, more recently, emphasis on the popular APSF Web site (www.apsf.org). In the early 1980’s important advances in technology became available. Electronic monitoring that extended the human senses (inspired oxygen measurement, capnography, and pulse oximetry) allowed genuine real-time continuous monitoring of oxygen delivery and patient ventilation and oxygenation. In the mid 1980’s, medical liability concerns continued. The ASA inaugurated the Closed Claims Study, which continues today and has yielded important discoveries through study of anesthesia mishaps. Also, a committee was formed at Harvard to study the causes of anesthesia accidents there. The analysis led to the first standards of practice for minimum intraoperative monitoring. The intention was to codify and institutionalize specific behaviors that constituted “safety monitoring,” a strategy for preventing anesthesia accidents. In 1986, the ASA adopted an expanded form as a national standard, a landmark step for a medical professional society and which epitomized the lead role taken by anesthesiology in the nascent patient safety movement. Additional ASA standards and guidelines followed and, later, the ASA developed evidence-based practice parameters, including the widely respected “difficult airway” guideline. The American Association of Nurse Anesthetists has promoted patient safety efforts to its members, such as through its recent Standards for Office-Based Anesthesia Practice. Again in the 1980’s, other engineering advances made anesthesia delivery systems safer, such as gas ratio protection that prevented accidental shut off of oxygen flow. The FDA anesthesia machine checkout protocol was developed and widely adopted. Improvements in anesthesia medications afforded more specific and controllable pharmacological actions and fewer dangerous side effects. Human factor and resource issues also played a key role in improving anesthesia patient safety. In 1990, the APSF and the FDA convened an unprecedented expert workshop on human error in anesthesia practice that helped stimulate later advances. The improved quality both of trainees entering the field and anesthesia training programs are certainly important elements of the anesthesia patient safety story. The extension of the residency to three years and the explosion of anesthesia textbooks, journals, and meetings contributed via the knowledge base. The incorporation of sessions on safety topics in the scientific program of the ASA annual meting also raised awareness while disseminating research and information. In the late 1980’s, supported by APSF grant funding, realistic patient simulators were introduced into anesthesiology. Further publicity and advocacy from APSF has led to anesthesiology becoming the leader in the application and adoption of simulators, with strong patient safety implications through education (residents attempting new skills for the first time on a mannequin), training (teamwork, critical event management), and research (human performance). Use of realistic stimulators has now become common in several other specialties. The success of the anesthesia patient safety movement was recognized significantly when the 1996 the American Medical Association and corporate partners founded the National Patient Safety Foundation, based on the APSF model. Further recognition for safety efforts and leadership came to the APSF in the landmark 1999 report from the Institute of Medicine on errors in medical care. A June 21, 2005 front page article in the Wall Street Journal singled out anesthesiology, the ASA and APSF for their role in making anesthesia safer resulting in dramatic decreases in professional liability insurance premiums paid by anesthesiologists. A “culture of safety” has developed in anesthesia practice, highlighted by the hard work of the APSF and the ASA, as well as by the adoption of a more systems-based approach by many anesthesia departments and groups interested in optimizing outcome of anesthesia care. Overall, the combined impact of all the initiatives has been a 10 to 20-fold reduction in mortality and catastrophic morbidity for healthy patients undergoing routine anesthetics, an evolution of which the entire profession can be justifiably proud. By the mid 1990’s, liability payouts had decreased to a proportionate percentage and the insurance “risk relativity rating” for anesthesiology compared to other specialties had been dramatically reduced. The work of improving anesthesia patient safety is by no means done. Equipment and systems still at times fail and, also, basic preventable human errors still do sometimes occur. Further, increasing “production pressure” in anesthesia practice from expanding clinical demands in the face of diminishing resources may threaten previously won gains. The profession as a whole must consider and address this. The APSF continues to work hard both on established tenets and new safety principles. Recent emphasis has been integrating electronic anesthesia information management systems and audible alarms on physiologic monitors into safety strategies. This stimulated major projects to standardize terminology for anesthesia records and definitions for a proposed widespread anesthesia outcome reporting system that is being developed by the APSF Data Dictionary Task Force/International Organization for Terminology in Anesthesia committee with support from clinicians and vendors of automated information systems. Application of a systems approach to anesthesia care continues though research into the success of “high reliability organizations” and how that model can be applied to anesthesia practice. 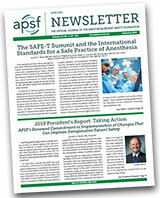 Other safety initiatives sponsored and supported by ASPF include safety of postoperative opioids and a call for continuous monitoring of oxygenation, recommendations to avoid exothermic reactions between volatile anesthetics and desiccated carbon dioxide absorbents, the need for technology training on new equipment introduced into the operating room, and medication safety in the operating room. APSF has developed an operating room fire safety video for anesthesia professionals that includes CME credit. APSF is the principal financial supporter for the creation of a pediatric anesthesia adverse events registry being developed by the Society for Pediatric Anesthesia. Changes designed to improve patient safety often parallel the experience in aviation. Anesthesia safety, like aviation safety, was achieved by applying a host of changes that made sense (seemed like the right thing to do) and were based on an understanding of human factor principles. Improved anesthesia patient safety reflects doing a number of “little things” that, in the aggregate, make a big difference. Insisting on evidence-based data to justify patient safety changes may be counterproductive and delay adoption of important safety technology (pulse oximetry, capnography, audible physiologic alarms, technology training, electronic medical records). The APSF persists in pursuit of its mission of zero tolerance for injury to patients. It serves as a model for the pioneering collaboration and commitment of the entire constellation of anesthesia-related professions to the common goal of patient safety.